Welcome to the first round up of #dinner365 for 2014! It's been an interesting week. We had New Years, I visited a friend, caught a nasty cold/flu, and school/work started back up again. Day One: I had a bunch of bits of veggies in the fridge, so I made a wonderful turkey bean chili. It's one of those recipes that I've had in my head forever, that's grown and evolved with me. I almost never make it the same way twice. We've tried it both with and without the fried egg on it, but if you're really looking for comfort food, the fried egg is a nice touch. 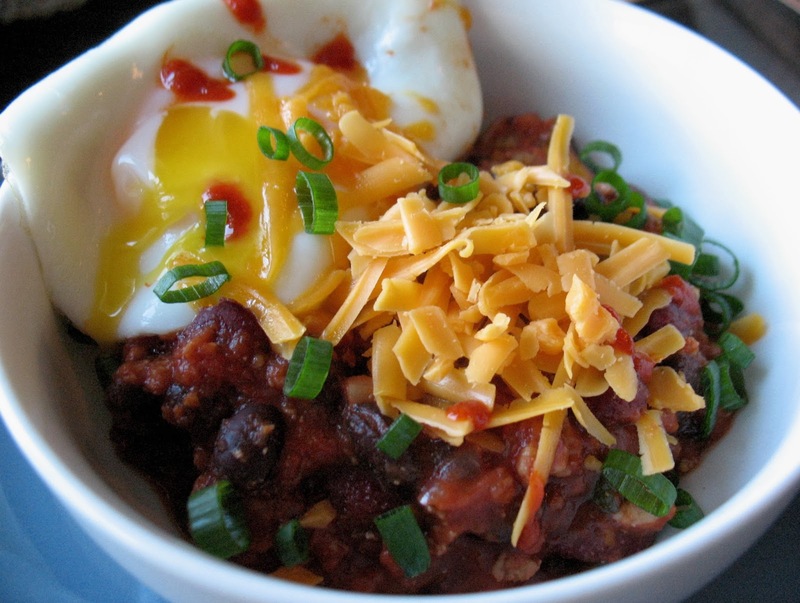 I love cheese on my chili-but then again, if you ask me everything is better with cheese. 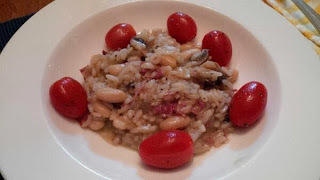 Day 2: I ventured into Vancouver for the day to visit my friend Alexis, and she made an amazing mushroom risotto with a fancy salami (which I can't even remember now, much less spell). I've tried making risotto once, and it was horrible. This was delicious. Obviously I need to be schooled in risotto. This photo is terrible and doesn't do it justice. AT ALL. She even made biscotti for dessert, and we had drinking chocolate to go with. Mmmm....it was delicious and sooooo nice to not have to cook.I always say, I don't care what other people make as long as I don't have to. You could present me with toast and I'd be thrilled. Day 3 was a bust. I had been feeling not so great towards the end of day two and by the next morning it was obvious I was sick. 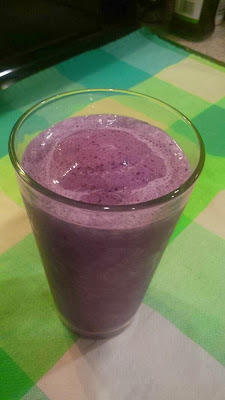 I didn't want to eat but felt like I should have something, so I made a smoothie. It's a good way to use up the 10 frozen bananas I have hanging out in the freezer. I know. TEN. Do they multiply in cold places or something? Although, my blender is so old and the plastic ring has a crack in it that I'm half expecting it to finally explode and spew smoothie all over my kitchen. I need a new blender SO badly. I threw in some nuts and a bit of oatmeal to make the smoothie more filling. It was smooth, icy cold, and totally hit the spot. What did my guys eat? I have no idea. There was an extra glass of smoothie in the fridge left over. Breakfast the next morning, perhaps? Day 4: Saturdays are always a little busier in the kitchen at my house. It's when I prep for the week or make things that I want to blog about because then the light is pretty good and in the winter, good light is a rarity. 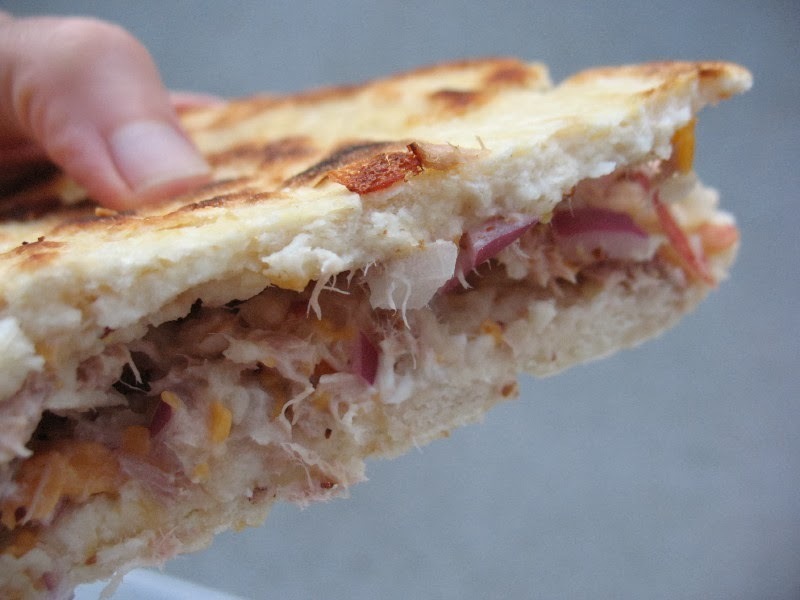 Since I was sick the day before, I still needed to make tuna piadina so I could blog it. I really got into watching Save With Jamie on Food Network, and this recipe seemed like a great way to use up stuff in the cupboard. I ended up buying his book for Christmas and there are so many good things in it, I almost don't know where to start. The piadina was great but the bread part took a few tries and isn't as puffed up as I expected. I think I may have to actually source out some self rising flour somewhere, because my substitution didn't work that well. It was almost biscuit like, rather than how it looked on TV or in the photos. That was easy to forgive though because it just tasted so darn good. I also roasted a chicken for Day 5's dinner and made gravy from the drippings. Then I baked up some of John's favorite cookies because he just can't function without them. Day 5: We don't really do turkey at Christmas. We do a chicken, it's usually gone soon after. I still had another chicken in the freezer, so I thought I'd try making a chicken shepherd's pie, but instead of using ground turkey I'd make it fancy. Shredded roasted chicken doused in real gravy sounded much better. I want to experiment. Plus I still had potatoes and vegetables to use up, so why not? It turned out well, but I think it needed a bit of tweaking before I wrote about it. 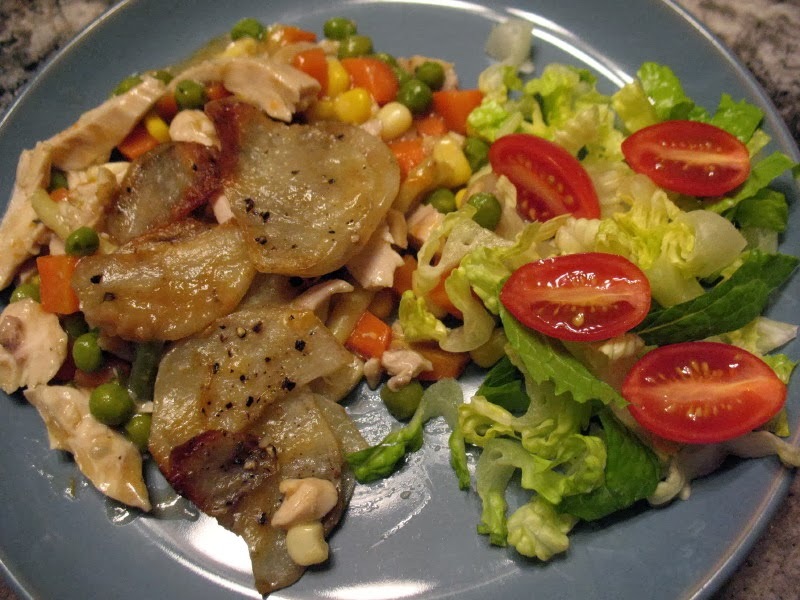 I wasn't entirely happy with how the potato topping turned out, and I wanted it to be better before I passed it on to you. I also heard somewhere that you can freeze gravy so I wanted to experiment with that. The verdict? Gravy made with flour works really well. When it's cold and thawed, it looks weird but while you heat it, the gravy comes back to life and turns out amazing. Who would've ever thought? Here's a tip; freeze your leftover good gravy for when you want to make poutine. Day 6: This was where it all went downhill. Back to work! Gotta get going! I'm feeling okay, right? Right? Oh boy. Nope. I came home after work, sat on the couch, and I promise you, I didn't move for the REST OF THE WEEK. I had the flu. Not even a version where I could actually have bouts of feeling decent, but a really, really bad version of it. I did, however, somehow manage to squeak in some vegetarian enchiladas. I'm not sure how that happened. Maybe I was hallucinating. I didn't actually eat any, but my guys did and said they were delicious. Day 7: Leftover night. Or whatever you can find night. I was still down with the flu. In fact, I was so feverish I don't even remember. Day 8: Ditto. By now it was getting old for my guys. They were rummaging through the fridge whining about what was not happening for dinner. AND they couldn't figure out how to turn on the dishwasher. Note to self: teach them how to turn on the dishwasher. 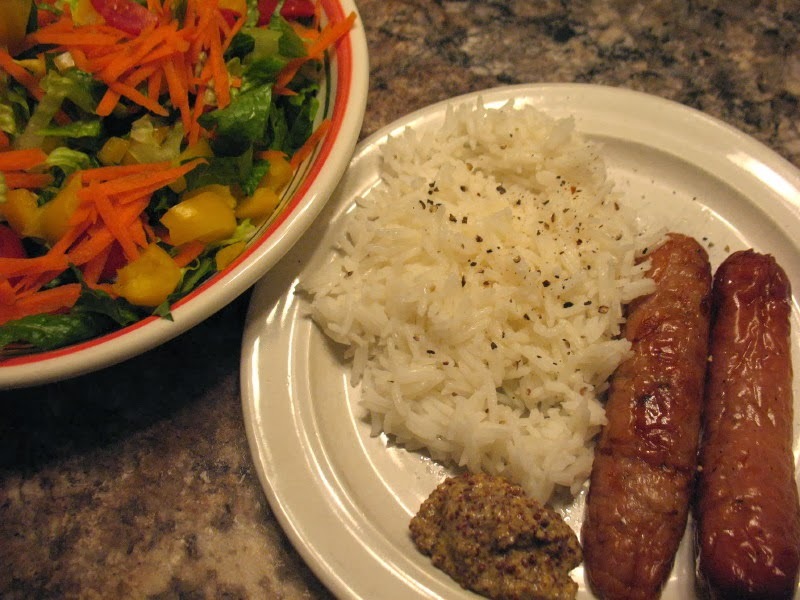 Day 9: I peeled myself off the couch to thaw a few sausages in the freezer, toss a salad, and steam some rice. Simple, yes. On the other hand, my guys were happy and even though all I ate was a bit of sausage with grainy mustard and some rice, it was pretty good. Don't even ask what's for Day 10. I have no idea, but I figure I'd better come up with something before I have someone ordering out for a pizza. What a way to start the year, huh? Better luck next week!